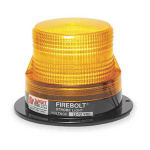 For dependable warning at an affordable price, you can count on the Firebolt® strobe beacon. All models feature modular construction for easy installation and maintenance. Power supplies are moisture and vibration resistant, and will automatically adjust to function at multi-voltages. The impact-resistant, polycarbonate dome and base provide added durability in heavy-duty applications. Permanent and magnetic mount models are available and include the necessary mounting hardware.